The American Kennel Club announced Thursday that the 2.5-year-old Labrador retriever is being honored for his loyalty, dedication and distinguished service. Sully was paired with the former president in June 2018 to help him with everyday tasks and provide companionship. He remained faithfully by his side until Bush's death in November. Sully will be honored with a medallion and an engraved plaque in honor of his notable service to the late president. "The devotion and comfort that dogs provide their owners goes unmatched," AKC President and CEO Dennis Sprung said. "Sully served the late President George H.W. Bush honorably; providing him support and assistance, but even more importantly, love and companionship. The 2019 AKC Paw of Courage gives us an opportunity to pay tribute to the devotion that Sully brought to the late President in the final months of his life." 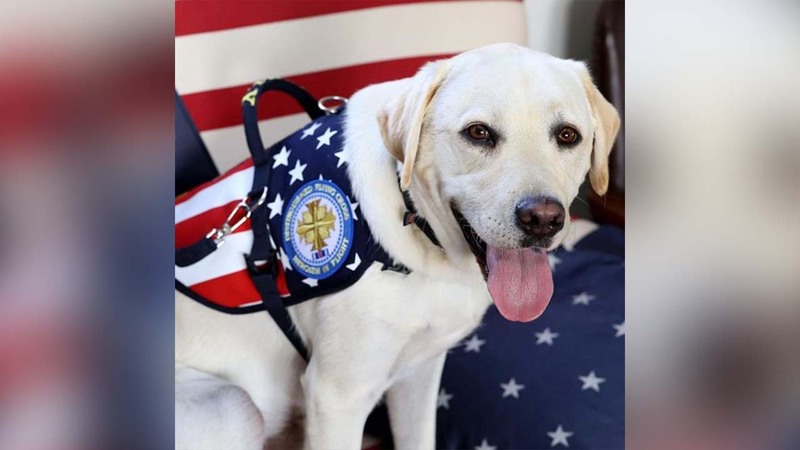 Sully recently joined the Walter Reed Bethesda Facility Dog Program as a Navy Hospital Corpsman Second Class in February 2019. His duties there are a bit lighter than what he did for the president -- Sully's main job is interacting with patients to help reduce their stress. America's VetDogs, a national nonprofit service dog provider based in Smithtown, New York, will accept the award on Sully's behalf. "America's VetDogs is very proud of Sully and his service to President Bush," President and CEO John Miller said. "Sully is a wonderful example of all of the service dogs that we provide to our nations veterans and we look forward to him continuing his mission at Walter Reed National Military Medical Center."